When a recipe calls for a can of evaporated milk, did you know there’s a quick and easy substitute you can use instead? This little trick will let you make a homemade version of evaporated milk and it’s easy on the budget too! Evaporated milk is a shelf stable canned product made from fresh milk that has had about 60% of the water content removed. Evaporated milk first gained popularity before the days of refrigeration. If you added an equal amount of water back to a can of evaporated milk, you once again had a liquid that tasted like fresh milk. Today, we use evaporated milk most often in recipes where we want a creamier and richer taste than just plain milk can provide. 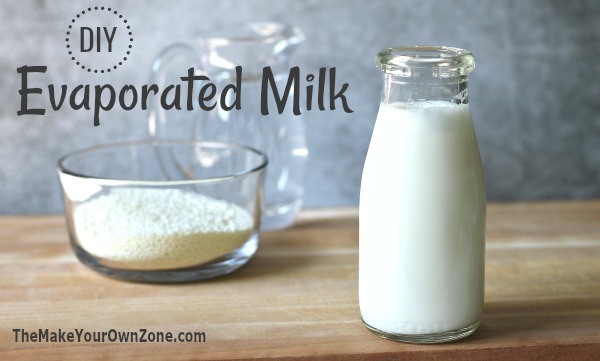 Remember that evaporated milk is different than sweetened condensed milk which has sugar added to it (and by the way, you can also make your own sweetened condensed milk!). 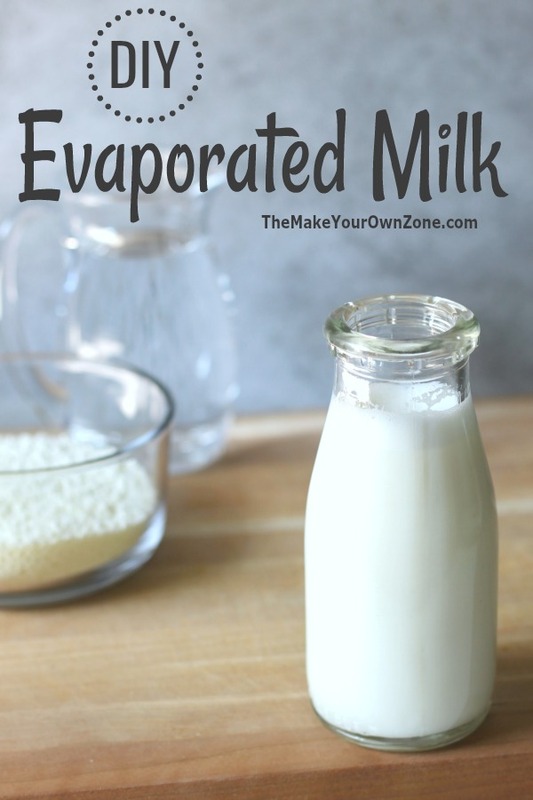 Because evaporated milk is fresh milk with some of the water removed, there are a couple ways you can go about creating a homemade version. One way is to boil milk down to about half its volume. However this takes a little more watching and stirring and guessing on when you’ve reached about half of what you started with. 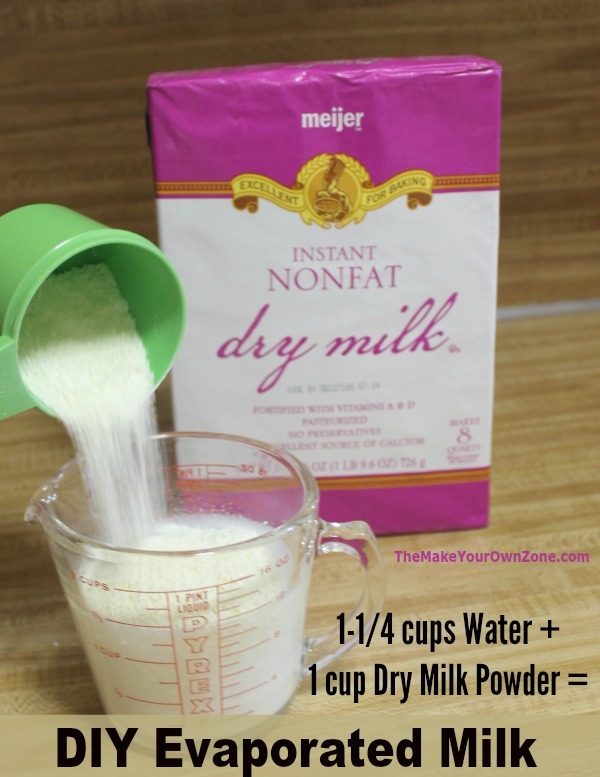 Instead, I like this method that uses powdered milk at twice the ratio to water as you would normally use it. This also give you a creamier milk product with less water in it that you can stir together in just a few seconds and works great. To make the equivalent of a 12 oz can of store bought evaporated milk, I combine 1-¼ cups water with 1 cup of dry milk powder. I’ve found that my 2-cup size measuring cup works great for this. I first measure the water out into my measuring cup. 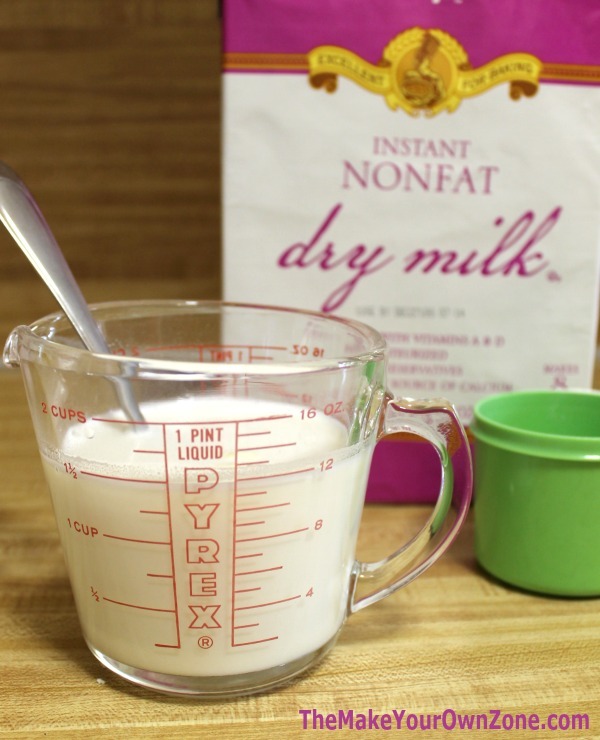 Then (using my measuring cup for dry ingredients) measure out the cup of dry milk powder and add it into the water. Dry milk powder dissolves pretty quickly so with only a bit of stirring, I’ve got my homemade evaporated milk ready to go. Make a quick and easy substitute for a can of evaporated milk using this simple method of combining water and instant dry milk powder. Measure out the water into a 2 cup measuring cup. A mixing bowl can also be used if you don't have a large measuring cup. Add in the dry milk powder and stir together until the milk powder is dissolved. Use as a substitute for a 12 oz can of evaporated milk. You’ll find that when you add in the 1 cup of dry milk powder, the mixture increases in volume and you end up with exactly 12 ounces. Perfect! Update: Since first publishing this recipe I’ve also been asked what measurements to use if you want to make the equivalent of a 5 oz can of evaporated milk. The 5 oz size isn’t quite as popular but every now and then you might come across a recipe calling for this size. I’ve used this recipe as a substitute for evaporated milk in my favorite tuna chowder and it worked perfectly. I’ve also used it with success in my pumpkin pie recipe. And if you need a couple ideas for using up a big box of dry milk powder, you can mix together some homemade hot chocolate mix, some homemade peppermint hot cocoa mix that you can layer in a jar for gift-giving, or some homemade pudding mix. Might as well just buy evap. milk since you are going to the store to buy powder. Well those bags or boxes of milk powder are usually a large size and last a long time, so if you have that sitting in your pantry it’s an excellent way to not have to go to the store for evaporated milk in a pinch. Dors it whip. Like store bought? I have not tried to whip this mixture, and it might be worth a try, but I’m rather doubtful that it will work. I only have non fat milk, can I reduce that down to make evaporated milk? Yes, I think that method would still work with nonfat milk as I think some of the water content would still reduce away. Half & Half could perhaps be a substitute if you are in a bind, however it has a creamier taste than evaporated milk and might change the taste of your finished recipe. Thanks for this recipe for canned milk. Going to use in my pumpkin pies to. I was excIted to find this substitute, but disappointed with the result. I used 3/4 C water and 1/4 C powdered milk to make 1 cup Evavaporated milk. When I used this in my coconut pecan frosting, the frosting tasted like powdered milk. The ratio must be very important. Oh yes! Ratio is everything! If you can remember the exact measurements, then always remember equal parts water to powdered milk, adding a little powdered milk to adjust thickness. no need to boil?…am going to use hot water when dissolving the powdered milk? There is no need to boil the water, and you really don’t even need hot water. Powdered milk dissolves very well in lukewarm water right from the faucet. Thank you!! Can I use regular milk or lactaid in a recipe for flan that calls for evaporated milk?? Thanks! Evaporated milk has a richer, creamier flavor than regular milk or lactaid. 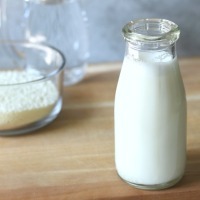 If you substitute regular milk in a recipe, I think the texture of your final product will be OK, but it might not have quite as rich of a flavor. I want to make fudge but I can’t find any evaporated milk in my country. Would this work? I have successfully substituted this homemade version of evaporated milk in recipes, however I have not tried it in fudge. Even though I haven’t tried it personally I think it would work and would certainly be worth giving a try. I found your recipe tonight while I was all geared up to make fudge and realized I was out of evap. milk! I was using the “quick” recipe that uses sugar, chocolate chips, butter, marshmallow creme, vanilla, and evaporated milk. I substituted the DIY version for the milk and the recipe worked great. Next time I would probably thin it out with a TINY bit more water as the sugar, butter, and milk mixture seemed to come to a boil very fast and there was some crystallized sugar that didn’t have time to dissolve thoroughly. Overall, though, I’d call this one a win! Thanks! Love your story Debra! That’s my hope for many of the DIY ideas I share here. They might not be something you do all the time, but they are great tricks to have up your sleeve when you need a resourceful solution in a pinch. AND if you do choose to do them all the time, that’s fine too and they can be helpful money savers. Will this work for a homemade nonfat whipped cream? The recipe for homemade whipped cream calls for evaporated milk. I’m not sure this would work for a nonfat version. I think you need the heavy whipping cream (not evaporated milk) to make a good homemade whipped cream. Even then I can’t seem to find it… I checked at the health food store… sigh, no go… do you know a brand…. Ty for the recipe! Me and my husband are changing our eating lifestyle to healthier foods so I bought powdered milk and just made a pumpkin pie! I use evaporated milk to make my Coquito (puerto rican egg nogg). I get a lot of orders during the holidays and I’m wondering how long this recipe will last? Alcohol is in the coquito and they’re stored in glass bottles. Thank you for sharing. I avoid recipes calling for evaporated milk because I never have any on hand. Like the savings too! If you have a box of powdered milk in the house, it’s definitely an easy way to be able to make any recipe calling for evaporated milk too! I really didn’t know this! Thanks so much for sharing this. There are times when I am baking or cooking and am short of evaporated milk, now I don’t have to worry about it any more! Thanks for linking to the In and Out of the Kitchen Link Party. That’s why I like this recipe too . 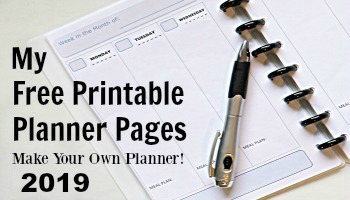 . . it’s a great way to be able to use what you have in the cupboard to make what you need.